Which, by the way, is never a bad thing. Although almost all the cookies I've made are on their way to Canada, so I'm not really up to my ears in cookies anymore. But I'm getting ahead of myself. This morning I first made a batch of granola and then realized I didn't have enough powdered sugar to make the macarons I wanted to make for the memorial service. Off the the store, to get much more than just a bag of powdered sugar, of course! Oh! You know how I was collecting those Monopoly game pieces? Well, I haven't won anything from the game board yet but I did win a $25 gift card to the grocery store as an instant prize. I cashed that in today and used that for my groceries. Kinda cool! Once I got home I tried to make chocolate macarons. I went online to figure out how much cocoa powder to add and even added an extra egg white to the meringue since the cocoa powder dries things out. Despite that, and after piping all 8 half-sheets of cookies, the batter was too thick and the cookies cracked. I decided they weren't pretty enough to use, so I made another batch (the first batch was a half-recipe and the second batch a quarter-recipe; a quarter-recipe makes 4 half-sheets) but didn't use cocoa powder. Instead, I added a little espresso powder to tint the meringue and add a mild coffee flavor. 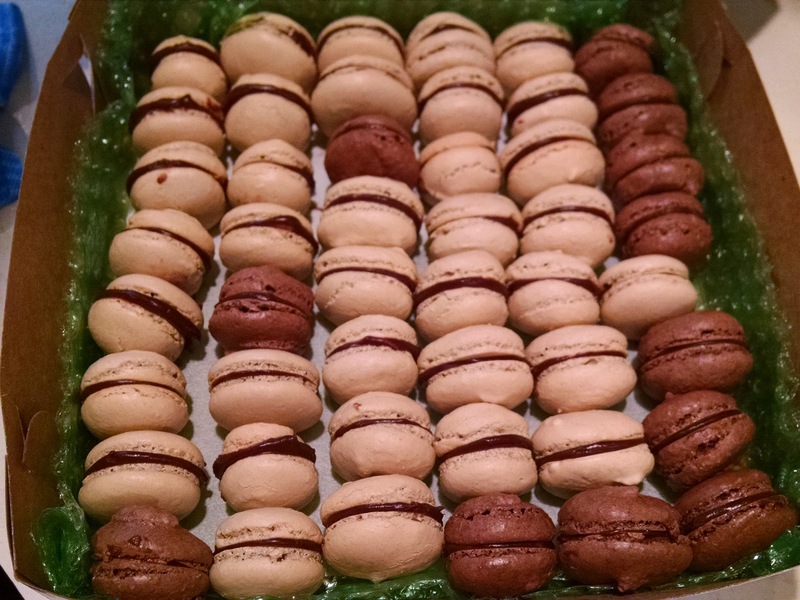 Since they all had the same chocolate ganache, essentially I made mocha macarons. These came out better, but still many of them cracked. I was able to get enough pretty ones to set aside 3 dozen mocha and 1 dozen chocolate macarons to send off to Canada. That, plus the 3 dozen lavender cookies and the 2.5 dozen lemon sablées is, I think, plenty. I did assemble a lot of the remaining cookies and have a box to give my neighbors and some for us to enjoy at home. UPS is very kindly shipping my box of cookies up to my cousins with a plan to arrive on Monday. Hopefully they will get there unscathed. I would hate for them to be ruined somehow!